The conquest of the Middle March after the death of Llywelyn ap Iorwerth appeared secure by June 1242, when Ralph Mortimer was summoned to Gascony in all haste. In his absence his eldest son Roger, just eleven years of age, continued his work, finishing their new castle of Maelienydd. That this was Cefnllys is confirmed by cross-referencing the various accounts of the fall of this castle in 1262, where it is referred to as both the new castle of Maelienydd and 'Kenenthles'. According to the Wigmore Genealogy there were two new castles, Cefnllys and Knucklas. These existed on 2 October 1246, as 'Keventhles et Cnuclays', while to this list can possibly be added Tinboeth, operational by 1282. These are all Middle March castles in relatively high lying positions and of courtyard plan. That Tinboeth is not mentioned amongst the list of Mortimer castles and vills on the death of Ralph Mortimer on 2 October 1246 strongly suggests that the castle was not in Mortimer hands before this time. Similarly there is no mention of this castle during the Welsh wars of 1260-77. Consequently the story of Tinboeth's destruction in 1260 appears to be the creation of J. Williams in the early nineteenth century where he confused the castle with Builth Wells. He also appears to have initiated the confusion of this site with Painscastle, the Maud's Castle of the famous siege of 1196. Certainly Tinboeth castle appears in no extant historical record before 1282, and there is no reason to suppose it long pre-existed this date. Indeed its style would place it more in the mid to late thirteenth century as a contemporary of Dyserth in the Perfeddwlad (1241-63). In the Pipe Roll of 1283-4 the monies spent on the royal garrisons in the Mortimer lands were recorded under Staffordshire. Here it is stated that at his death Roger Mortimer owed £28 11d to the crown and that Wigmore and Cleobury manors had been taken into the king's hands. The garrisons kept for the king were Wigmore, 27 foot; New Radnor, four horse and twelve foot at £8 2s; Cefnllys, eight horse and twenty foot at £15 10s 6d; Tinboeth [Dynbaud], five horse and thirty foot at £13 16s 9d; Knucklas, eight horse and twenty foot at £15 10s 6d. It is interesting to note the differences in the garrisons, but we can only wonder at the reasons for these variations in size and composition. On 25th July 1307 an inquisition found that in the cantref of Maelienydd there was a castle at 'Dymbaud', but no town. Soon after William Mortimer the son of Roger Mortimer of Wigmore (d.1282) was mentioned as William of Castell Tinboeth in the Black Book of Wigmore. The castle was still functional in 1316 and in 1322 was amongst those Mortimer possessions that were surrendered to the king with the disgrace of that family. This appears to have been its last mention as a functional castle. Undoubtedly the successful conquest of Wales and the security of the previously volatile Welsh Mortimer lands ended the military purpose of this bleak fortress. As no civilian hamlet appears to have formed around this isolated site, and no political reason for it existence could be found, abandonment and decay seem to have followed rapidly, with the consequence that by Leland's day it was no more than the 'great ruines of a castle called Tynboeth'. Today the ruins of Tinboeth castle consists of a great rock-cut ditch surrounding an enclosure which was once fortified by a curtain wall. To the east stands the last forlorn fragment of the now largely collapsed twin- towered gatehouse. Killing platforms surround the ditch to the east and south. Further south again are three great gashes in the ground from which the stone for the castle masonry was probably dug. 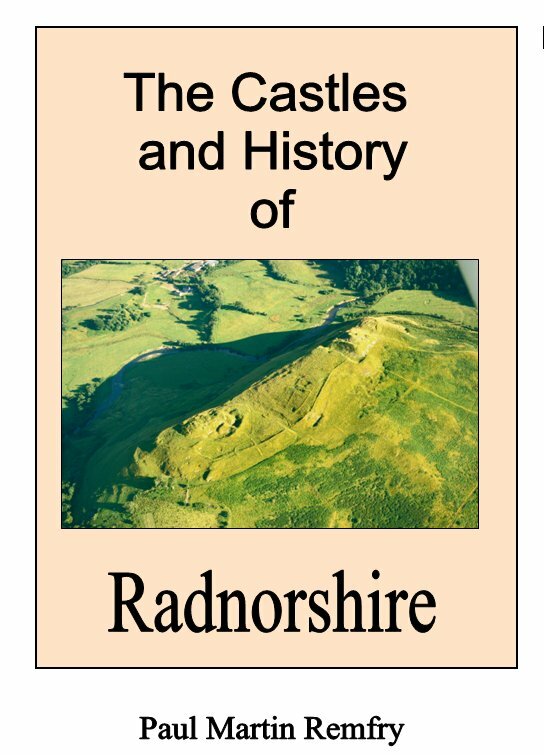 The Castles and History of Radnorshire (ISBN 1-899376-82-8) looks in great detail at Tinboeth castle and the adjacent fortresses of Cefnllys and Knucklas and suggests an origin for the three at the hands of Llywelyn ab Iorwerth of Gwynedd, rather than by the Mortimers. The book consists of 309 pages of A4 and examines in greater detail the history and castles of Radnorshire and Rhwng Gwy a Hafren. Starting in the early eleventh century the book covers the age of the castles up to the Civil War of 1642-46. Each castle description is buttressed by numerous photographs and plans of the earthworks and remains where they survive. A new look is also taken at the battlefield of Pilleth and the evidence for the course of the battle is scrutinised. The book also contains genealogical family trees of the major historical Radnorshire families and a full index.